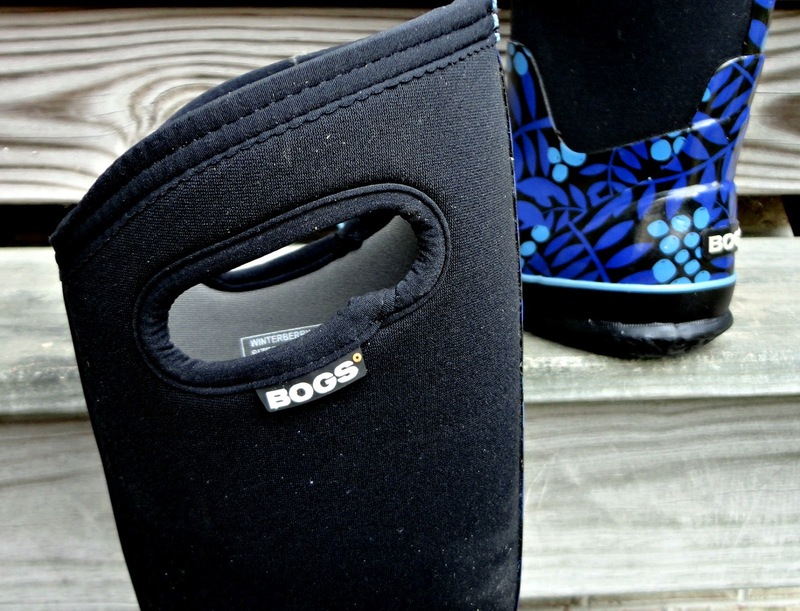 Giveaway: Win a pair of BOGS! 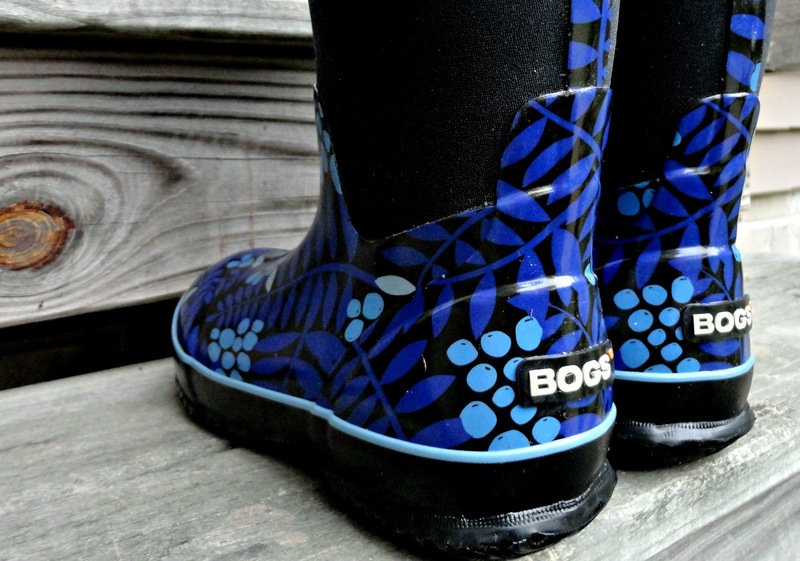 Congratulations to Maria M. who has won a $100 Gift Card from BOGS Footwear! 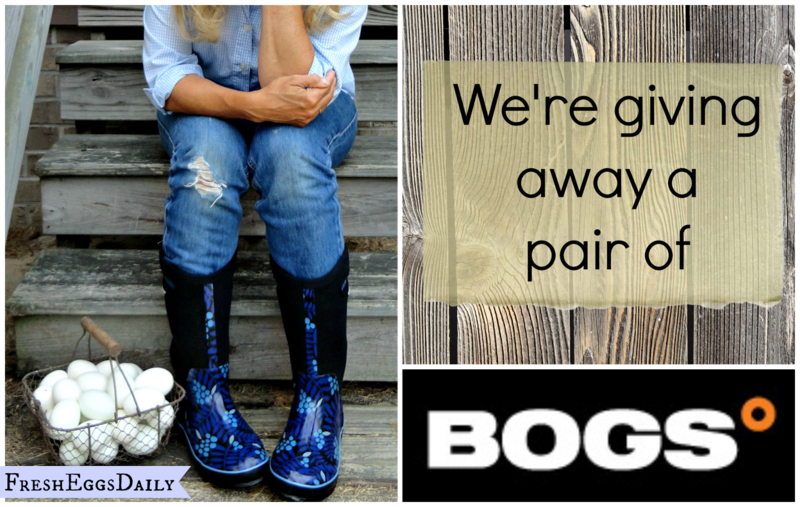 We are so excited to be partnering with Bogs Footwear for this fun giveaway! One lucky winner will be given a $100 Bogs Gift Card to use to purchase a pair of Bogs® of their choice! To help promote their new fall line, Bogs Footwear sent me a pair of Winterberry Classic Hi Boots to try out. These winter boots feature pretty floral printed rubber accenting a solid black stretch neoprene lining and a moisture-wicking inner lining. They are 100% waterproof and feature non-slip soles. They have pull-on handles to make putting them on and getting them off a breeze. Rated down to -40 degrees F, these boots will keep my toes warm all winter long! Contest is open to US and Canadian residents. One winner will be chosen at random from all entrants who satisfy the entry requirements by midnight on Monday, August 26th. Good luck! Now if winter would just hurry up and arrive, so I can try out my new boots in the snow! I want a pair of these so bad!! 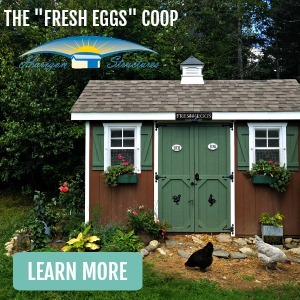 They look fantastic for gathering eggs and shoveling snow in the middle of winter! Oh thank you for the chance to win a pair of these boots! I like all of the BOGS, but I would have to choose the Classic Mid Handles. Man... The purple Linen classic hi are so cool! I keep flying through the cheapy rainboots from the feed supply store. They always end up splitting at the sole and I end up with wet toes after a couple months! 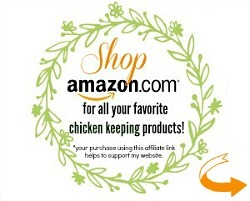 Having a pair of these would be oh so useful for doing my chicken-chores! 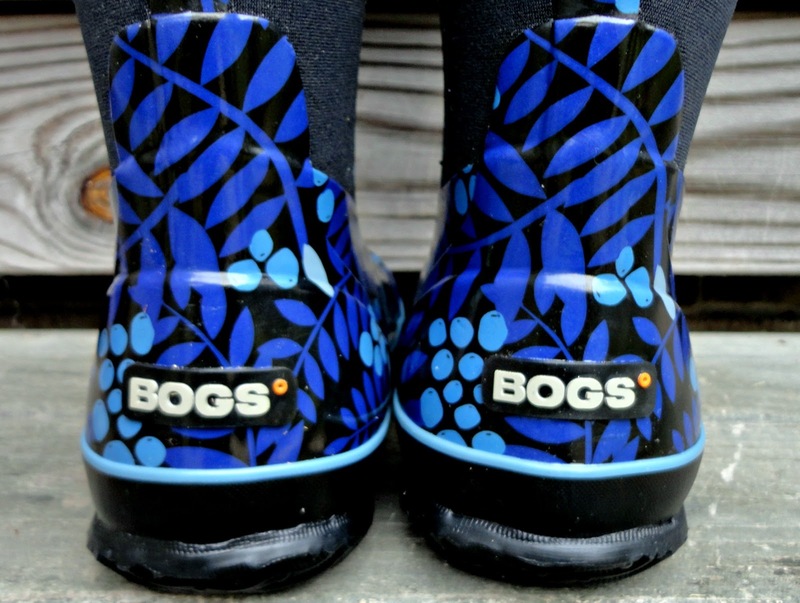 Thanks for the chance to win a pair of BOGS! Oh if I had to choose one it would be HERRINGBONE PLIMSOLL HI WOMEN because it matches my wool winter coat. Thanks for a great giveaway! I love these BOGS!! I would pick the rain boot!! Thanks for the chance to win a pair of bogs. Love the blue & black. $79.00 ITEM #71277-492 and then also get some socks! I like the Sweet Pea Classic mid woman's or the Linen Classic Hi woman. Thanks for a chance to win a pair. I like the Drake Buckle in green for women...cute boots. Plus my son 'borrowed' my rubber boots and has now claimed them. I need a new pair. The Wish Rainboot would be perfect. Love the colors and they would keep my feet clean & dry wether cleaning the coop or working in the pig pen!!! I want the rain boots that are a green color with veggies all over them!!! I LOVE those. I love love LOVE the Dakota short boot! But since they are "coming soon" then I would pick the Sweet Pea Classic Hi. Love them all though! Was just looking at these kind of boots at walmart. Bogs look like the absolute best! I have an old pair and LOVE them, but they are starting to fall apart. Not bad for 4 years of almost everyday use! So I would love to win another pair for this winter! Would love a pair....but I need the ones that are lower on the calf....not so tall!! I think I like the Harper the best would love it in rose and I could spray my shoes after leaving the chicken run without getting the inside wet. Like the mid classic also.fingers crossed love your site. Those are SUPER cute! Quality is so hard to find sometimes! I love the Classic Mid Vintage in any of the beautiful colors! The Mid height would be perfect in our fairly mild California climate. Thanks for the chance to win a pair! Fabulous!! I've been eyeing a pair of these at the local shoe store. 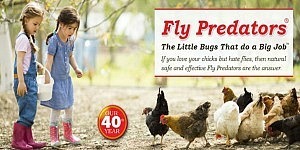 Especially for the kids, who love playing out in the morning dew! I'd take the Harper! Love the green and need a less full boot so I don't get so hot in the summers. Love these! Would love to have a pair for our winter/monsoon season down here in the south. I like classic high garden. Right now I have old stinky flip flops as my "chicken shoes" but know as the cold weather approaches I will need good water/weather proof boots. These are beautiful boots!! the winter berries would be great anytime. Love them! I loved them all, but I think I'd go with Summit Women ITEM #71423-001. It looks like a good year round outside boot. I like the classic mid boot! The sweet pea looked nice and comfortable! My mother-in-law, daughter or wife would love a pair of these. If I don't win I will seriously consider buying some for gifts. Would love these. Michigan gets cold!! Thanks for this chance. 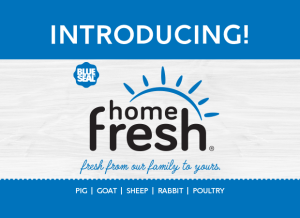 I am sharing on my FB page...DaybyDay Homestead. Fern Plimsol High ...because we have a lot of poop to wade through at our place, between the Horses, the Chickens and the Garden...you really need some high top boots!! Size 9 pls..
Love the Plimsol Herringbone Mid! Perfect for early morning walk. I would buy the Harper Daisy boots. Or the Summit Women's washable boot. Gosh I love these! The Linen Mid Classic looks great! To many to choose from though! I like women's spring rainboot with the daisy pattern. I'd choose the pink classic garden boots. 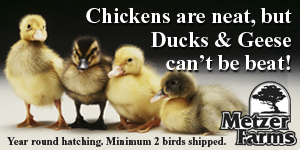 I could use the cute Rue to muck with my ducks! I like the Summit! Very cute! These would be so nice! My boys all have boots to go out and work in, but I still do not. They have so many cute designs. Would be nice if there was a farm theme also, some chickens, ducks, cows. I would really enjoy some Bogs. I'm having such a hard time deciding, but I think I would choose either the Winterberrry Classic Mid or the Sweet Pea Classic Mid. Thanks for the giveaway! I can't decide between the Rue Daisy, the Harper Daisy, or the Classic Mid Daisy. I guess I just love all things Daisy! Thanks for another great contest! I would love a pair! I think I'd go with the Solid Plimsoll Hi Women. I'm a classic kinda kid...lol. I LOVE all of them!!! Linen or Rue Daisy. OMG! I need a pair, been searching Ebay so much lol. Love those boots! I don't understand why you have to be a Facebook member to enter giveaways on so many blogs. I don't do Facebook and I feel like I am being segregated from those who do. All well I will settle with one entry when everyone else gets 3. I still love your blog even though you segregate against me. What a hard decision!! I'm thinking Rue or one of the mid calf styles. I'd love the classic high garden in green, but might have to order men's because my feet are so wide. They look great! I love just about any color, my chores shoes have about had it, I have been looking for something different! They are beautiful! I would pick the same ones you have! Love the blue an black! I like the classic mid handles! Secret Garden Classic Hi Women.. They look awesome! I love the tall classic, any color! I am loving the Herringbone Plimsoll Hi Women...i love grey, and they look SO cozy. I've coveted BOGS for a long time... pick just one? That would take much browsing! Love these BOGS... I had a pair that finally wore out. I wore warm woolie socks under them in the winter... fantastic, waterproof! 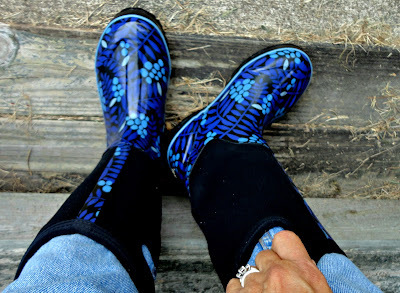 I would LOVE the Wish Rainboot Women in blue! I need them for mucking out the chicken coop and run! They look fantastic! 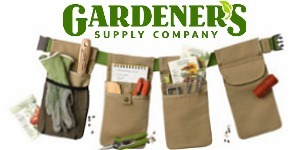 Since it's rainy in these parts, I really could use a pair for non-summer gardening and chicken keeping! Thanks for hosting the giveaway! I would like the Classic Ultra High Boot. These look great! I like the ones you have on they are my favorite but they all look great! Thanks for hosting this giveaway! I would choose the Sweet Pea Classic Mid Women. I would love to have a pair of these. They look great and very practical. I'm loving the Rue! 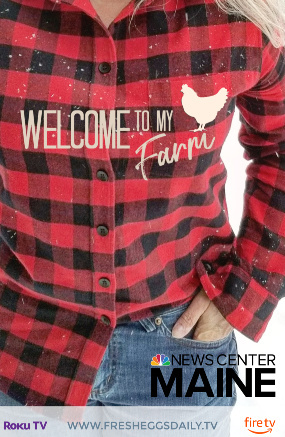 I've really been needing something I can slip on and wear out to the chicken coop. Each time I find myself in the run with flip flops on I curse myself for not buying some already. Chickens have an affinity for red toe-nail polish you know.. Thanks for hosting this giveaway! Would love a pair of these. The Winterberry Classic High is awesome! Love the boots! so glad you got to try some out - if they passed your inspection then they're all right by me:) Could definitely use a pair this coming winter. Thanks for doing the giveaway, Lisa! p.s. I would order the wish rainboot - probably the teal colors. Or pink. Wait, I dunno - I like them all! I'm a daisy girl myself so I really like the Classic High Daisy boots. They are all super cute though! Love these boots! 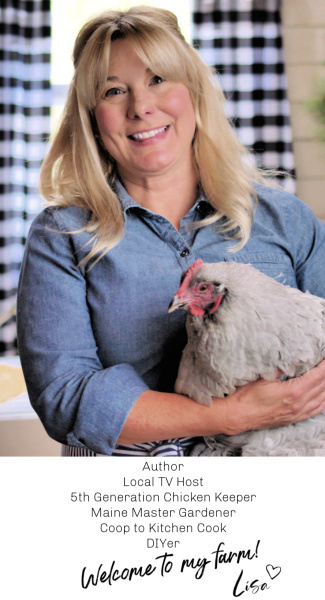 Purple is my favorite color and would really jazz up my coop chores! Love the blue and black boots! 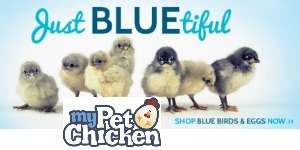 My chicks will arrive in April, so excited! Bogs are great! I love having warm toes all winter! I love my Bogs, they are the best garden/farm shoes ever! I love the Rose in the veggie print! Wow these are some really cool boots, just showed my hubs, love the daisies! Love those hi green ones! That sure would make for some fancy stepping! I like the blue and black ones you have. So cute! There are so many adorable patterns. Dakota High, or the Sweet Pea mid...I can't decide (the heel on that Dakota high could be a good sub for a riding boot in a pinch). These would be great for mucking about in the garden or helping out at Mom's farm (gotta love that east Texas clay)! My daughter introduced me to Bogs! ok, it's the mid classic: either daisy, sweet pea or linen. or.... oh I dont' know yet! 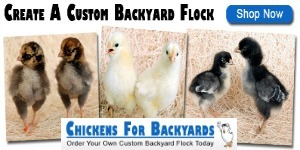 My wife would love the one's like you had in your pics, to help with the chickens we got from you. I love the Linen Classic Hi in teal! Thanks for the chance to win a pair! My daughter needs these....she gave her rubber boots to her grandma. I would choose the boots with the garden veggies on them! I like the ZOO CLASSICS KIDS. My sons would love a pair. Oh to be so lucky!Thanks for the chance to win! I would LOVE the Winterberry Classic Hi in PURPLE!! This is my first winter with my beloved chickens and I will have to walk through some high snow/slush to get to them each morning and night! Thank you SO MUCH for doing this contest! I LOVE these boots! Love the blue ones that you got! I like the Linen mid classic in purple. The women's rain boots for sure. Love that purple! Thanks for running the contest. I love them all, but I would pick the HERRINGBONE PLIMSOLL HI for women. I would love a pair of these boots! Perfect for winter in northern WI! I'd have to choose the winterberry. Blue is my favorite color. I am liking the Rosie Mid Plimsoll Women! I'd love to have a pair! Love them all, especially the high ones for the deep snow! Daisy high classic. So cute! What a great give away!! We don't get much snow here, but would still love a pair for winter time muck!! I love the Classic High style boots. Great for treking round the holler this winter! i love the classic high daisy or the linen rain boot. great boots for mucking about. I love the Rosie Mid Plimsoll boots! Could sure use a pair of your lovely boots for the coming Winter. That blue is beautiful. Nothing like beauty and practicality! I like the purple and orange flowered wish rainboots. But frankly, anything waterproof and warm for winter would be wonderful! Thank you so much for giving us the chance to win these boots! They are so cute (and look warm). 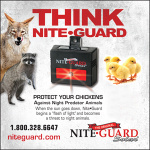 They will help so much during our cold New England winters! Love the high daisy ones! which would I choose...well, I'd have to choose the classich high. it is so mucky, cold, snowy here in the winter would be awesome! I would love to have the Sweet Pea Mid Rise boot!!! They are soo cute! The boots I have now are plain black! 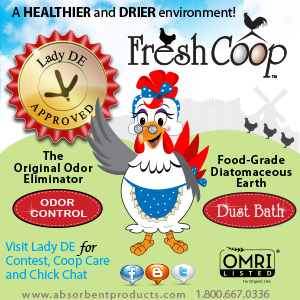 I'd love to be able to show a little pink while cleaning the coop! I have classic mids and wear them all of the time in the winter and when muddy. I could use the classic high handles for winter! So many colors it's hard to choose! Oh, I would love to win the women's rainboot!! I do hope I win. I'm torn between the blue Sweet Pea mid boot and the Blue Secret Garden. 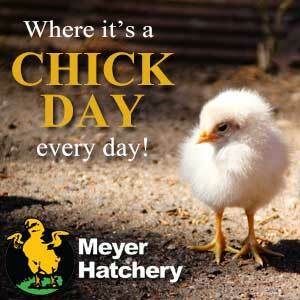 I think the chix would love to peck at either! They are wonderful, would love to have a pair. Thank you for hosting this giveaway. These would be perfect for me to wear in the barn taking care of my girls! Thank you for hosting! My Girls will think that I am truly stylin' in these! 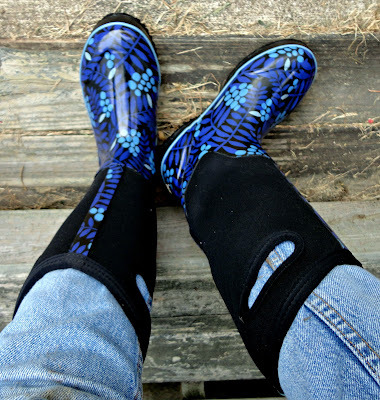 The Wish Rainboot would be the boot that I would choose to wear to take care of my chickens and cows. Thank you! Winter is on the way...these look really nice! 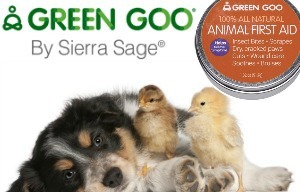 This country girl needs these Boggs! I would get the winterberry classic. Blue is my favorite color. I love the "Classic Mid" style, but I don't know which I like best! I love them all! My husband has a pair and he really likes them. I think I'd have to pick the Plimsoll Mid Leaf - I've always wanted a pair of red boots! Those are cute! And I would love a pair of insulated Bogs for the winter. I love my tall Bog boots I have now. Looks like what I need. Maybe the kids won't take them. They borrow all my boots and then I don't have warm feet, cause they don't bring them back. These look faboulas. If I don't win I will have to buy a pair . Thanks. Thank you for the opportunity :) My favorite is the Classic Hi Garden! I love my bogs! They are great for rainy days but I need something for Summer and Fall - I'd probably pick the Rue Daisy - adorbs! Would have to be the Sweet Pea Classic! Only see Mid, but the purple is awesome! Oh, would love to own a pair of these in the green. I need them for snow this winter. How lucky you are to be given a pair. These would be wonderful for all kinds of work, love the colors! These boots are amazing, I wish I could win a pair! I would love these as my old boots are all ripped and my feet get wet! LOVE these boots....and LOVE the chance to win a pair!! They look so warm and comfy! I am heading to the site to check out which color/pattern I would pick if I win! Thank you!! These are awesome! We live in Montana so doing anything outside for the garden, fence, dogs, the shop or eventually the chickens will require good boots! I love the Winterberry Classic Hi in green. Thank you for this Giveaway! 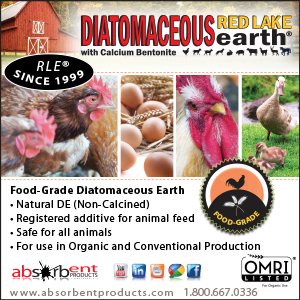 I LOVE Bogs...and Fresh Eggs Daily! I think the new winter line (Winterberry Classic Hi Boots) would be wonderful to have in my collection! They are absolutely the best! Classic mid women's Winterberry...very cute!! I love BOGS, they're great boots. Yes please! I would adore these. 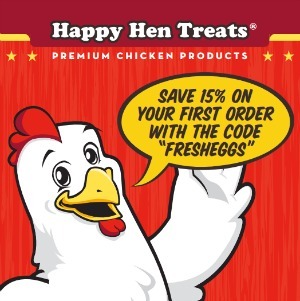 Been looking for some good chicken boots. Warm mud boots?! Awesome! I'm liking the Secret Garden. I love them all but I might gets the winter berry or the Harper daisy!!! So can't wait to hear if I win! really cute boots, winter is coming and the chicken coop is a nice walk hope my feet keep warm this winter. LOVE, LOVE, LOVE these boots, I am so excited! SOOO many styles and colors to choose from! I love that they have handles to help pull them on! I have short legs which don't work well in long boots, so I think I would choose the Sweet Pea Classic Mid Womens in the pink. Really cute! Perfect for slogging out to the hens and the garden when it's wet. Thanks! I love the Wish Rainboot ( purple) and the Sweet Pea (purple) ones! 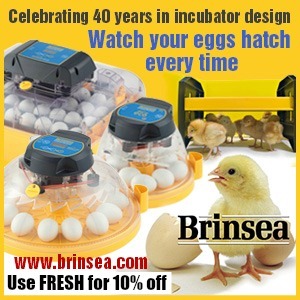 These would be great to walk down the hill in the winter to collect eggs! The Linen Classic in teal most definitely! CLASSIC HIGH HANDLES WOMEN'S I would love some bogs! The handles are such a good idea!! chickens and playing with the pony in the winter!! I've just learned about Bogs Boots this year. They would be great for our Indiana winter! I am loving the Classic Mid Garden! Great looking and super functional. I need some of these. Thank you for the giveaway! I love the white ones with the veggies on them. Too cute! I would love to have a pair of bogs to help me with my chores !! Thank you so much for the opportunity to win these !! 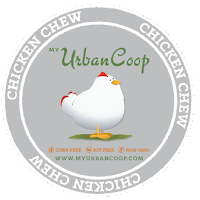 I would love to try these I had never heard of them.Im a big fan of your page .We have pet chickens and ducks . So nice that you have give aways. I love the Rosi Plimsol Hi boots! My daughter and I have been looking for a pair of Bogs for the granddaughter (5yo) for school. I am really digging the Carson that comes out this fall! That is one sharp looking shoe! CLASSIC MID DAISY Practical but make me smile! LOVE these boots!! The Fern Plimsoll Hi boots would be perfect for my cow/chicken/duck chores, especially in our midwest winters! LOVE bogs! I would chose the daisy patterns! Daisies are my favorite flower. 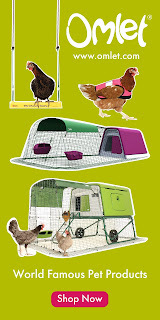 These would be amazing for me to take care of the chickens and ducks in and also to walk around the property in. I would pick the Classic Ultra High Boots! Love these!